An unusual tree, the Golden Indian Bean tree (Catalpa bignonioides 'Aurea') is identifiable for its large heart-shaped, yellow flowers that in summer cast a delightful shade. This makes this tree rather special. 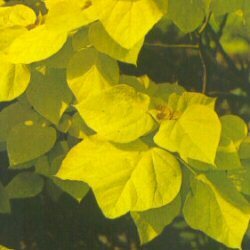 Initially, the leaves are bronze-coloured, soon becoming their trademark yello. Mid to late summer heralds the arrival of tall white flowers, generally followed by seed pods. We recommend this tree is planted in the middle of a lawn to fully appreciate its beauty but do recommend a sheltered position. A small tree, therefore expect a height of up to 4 metres (13 foot) after 10 years. Our Indian Bean trees are supplied at a height of between 1.2 metres and 2.4 metres in a 7-20 litre container, which means that the tree can be planted any time of the year and with better results than either bare-root or rootballed trees. Golden Indian Bean Tree, Catalpa bignonioides 'Aurea options. 150-180cm	: Around 3 years old and grown as a Half Standard. Usually 10-20 Litre pot. Single Stem	: This could arguably be called a feathered tree or a whip but it depends who you talk to. You would buy this single stem option if you wanted to prune and shape the tree to your desired shape later. Usually these are shaped to be a quarter or half standard which are explained below. Half Standard	: This refers to how much of the tree is clear stem. Roughly half the main leader will be clear of branches. Quarter Standard	: As above but less clear stem so you would see branches starting closer to the ground. See What Our Customers Are Saying About Our Golden Indian Bean Tree.